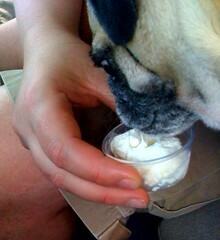 When we take the pugs to the vet we take them to Bruster’s after for a free doggy sundae. There isn’t a Bruster’s near us so it’s a big treat for us all. Kiki grew an odd bump on her toe and has been having some trouble with allergies this year (more serious than normal) so we took her in to see the vet. Afterwards we swung by Bruster’s for Kiki’s sundae. When we pulled up to the window to pay a girl employee was walking by the window, stopped in her tracks and said “Is that Kiki? ?” OMG. Kiki has fans. She’s being recognized on the street! You know it’s not going to be long now before the diva attitude sets in!